Felix the Cat is a cartoon character from the silent-film era. 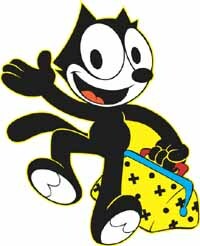 His black body, white eyes, and giant grin, coupled with the surrealism of the situations in which his cartoons place him, combined to make Felix one of the most recognizable cartoon characters in the world. Felix was the first character from animation to attain a level of popularity sufficient to draw movie audiences based solely on his star power. Felix's earliest origins remain disputed. Australian émigré, cartoonist, and film entrepreneur Pat Sullivan and American animator Otto Messmer have both claimed to be his creator, and evidence seems to back up both claims. Many historians, however, including John Canemaker, argue it was Messmer who ghosted for Sullivan. What is certain is that the cat emerged from Sullivan's studio, and cartoons featuring the character enjoyed unprecedented success and popularity in the 1920s. Paramount Pictures distributed the earliest films from 1919 to 1921. Margaret J. Winkler distributed the shorts from 1922 to 1925, the year when Educational Pictures took over the distribution of the shorts. In 1928, Education ceased releasing the Felix cartoons and several were reissued by First National Pictures. Copley Pictures distributed them from 1929 to 1930. He saw a brief three cartoon resurrection in 1936 by the Van Beuren Studios, but the glory of the old days had disappeared during the cat's short-lived stint in color and sound. Sullivan did most of the marketing for the character in the 1920s. Felix exploded into American popular culture and enjoyed great success overseas as well. He got his own comic strip (drawn by Messmer), and his image soon adorned all sorts of merchandise. Jazz singers such as Paul Whiteman sang about him, and Felix even became the first image ever broadcast by any television transmitter. Nevertheless, the success was short-lived. The arrival of talking cartoons, particularly those of Walt Disney's Mickey Mouse, eclipsed the silent offerings of Sullivan and Messmer. A few talking Felix shorts produced by Sullivan's brother failed to win back audiences. Television would prove the cat's savior. Felix cartoons began airing on American TV beginning in 1953. Meanwhile, Joe Oriolo, the new artist behind the Felix comic strip, gained the rights to feature Felix in a new series specifically for television. Oriolo introduced new characters, such as Poindexter and Rock Bottom, and he gave Felix a "Magic Bag of Tricks", which could shift into myriad shapes based on Felix's needs. Joe Oriolo's son, Don Oriolo, continues as Felix's caretaker today, and the cat has since starred in other television programs and in a feature film.